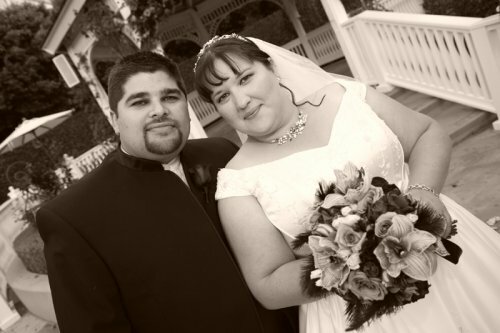 My husband and I have been married for 2 years, happily, and are both fat. I'm 32,&bsp; 5ft 4 in high, size 18, he's 30, a 42 waist at 5 ft 6in.....we are a matched set! I often joke about that. We aren't incredibly active, but we do walk at least 2 times a week, and while we certainly eat naughty things sometimes, our main focus is on healthy food that's prepared at home. The subject of weight loss has come up, but we just love food to much to be able to change our lifestyle drastically overnight. We met on Craigslist, surprisingly enough. I was looking to date, and he was looking for car parts. I have always found that online dating was better, as alot of people tend to look at the person's body before exploring what's inside, and emailing back and forth is a good way to determine if you'd even be a good fit before seeing the outer wrapping. We dated for 3 years before getting married at the Disneyland Hotel- it was magical and it's been magical ever since. We are childfree by choice, and consider eachother to be best friends as well as a married couple.